Munsell Color System; Color Matching from Munsell Color Company > Color Theory & History > What Color is Chocolate? The questions I have been investigating lately is when did, “chocolate” become a word to describe a color and what color was that, exactly? These questions are not as simple as they may seem; the answers have much to do with the cultural history of chocolate and how color gives flavor to our lives. In the Central American homeland of chocolate, cacao-rich foods and drinks have been a part of life for thousands of years. Linguists debate about the origin of the word “cacao”, the tree seed from which chocolate is made, but it is clear that the word for cacao is very old indeed. The word ‘chocolate’ in Mexico and Central America, however, is a relative newcomer, a Nahua word, from the same language family as the Nahuatl the Aztecs spoke. In pre-Columbian writing, chocolate and cacao indicate substances, not colors. In the sixteenth century, chocolate was widely known as a special drink from colonial Guatemala (that also included today’s El Salvador). European colonists consumed cacao-based beverages as early as the sixteenth century, but “chocolate” did not immediately become part of the vocabulary of other languages such as Spanish, English, or French when they started consuming cacao-laced foods and drinks. Chocolate was a substance so unusual that Europeans did not re-use a familiar word to describe it—they adopted the foreign Nahua name. So, when did this foreign substance infiltrate European ideas about color? 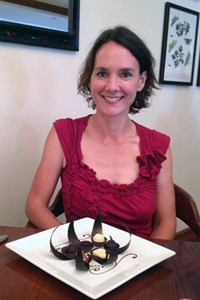 The idea of chocolate as a color shows the gaps we face among the documentary, visual, and material records. Chocolate came in many different forms and colors, so figuring out what tint people called “chocolate” says much about what the iconic feature of chocolate was. Early uses of the word “chocolate” as a color do not appear until the early eighteenth century, after Europeans had been consuming chocolate for some time. This new use of the word indicates a broad enough familiarity with the substance that it made sense, and it happened at about the time of an upswing in popularity of browns. Figure 1. 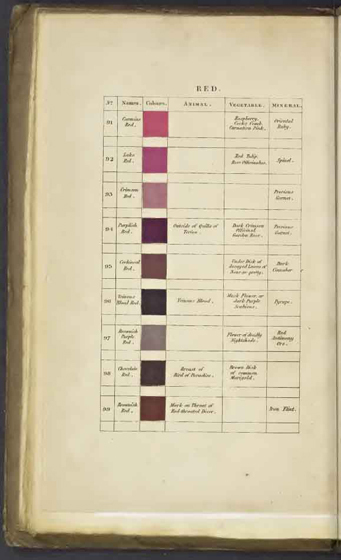 Color samples of browns, p. 74, in Werner’s nomenclature of colours : with additions, arranged so as to render it highly useful to the arts and sciences, particularly zoology, botany, chemistry, mineralogy, and morbid anatomy : annexed to which are examples selected from well-known objects in the animal, vegetable, and mineral kingdoms (1821), Werner, Abraham Gottlob; Syme, Patrick, editor; James Ballantyne and Co., printer, Edinburgh : Printed for William Blackwood, Edinburgh, and T. Cadell, Strand, London (https://archive.org/details/gri_c00033125012743312). An early use of ‘chocolate’ as a color occurred in William Salmon’s 1734 Palladio Londinensis, Or the London Art of Building to describe a house paint color. 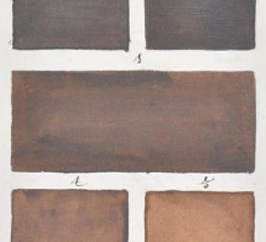 A detailed 1692 color guide written in Dutch includes many shades of brown (Figure 1). Likewise, in the historic textiles and clothing in the collection of the Colonial Williamsburg Foundation, browns are popular from about 1740-1760. Of all these browns, which one was “chocolate” brown? In the seventeenth and eighteenth century, chocolate was consumed as a frothy drink rather like today’s lattes, but it was also eaten as a paste and sold in tablets and bars. The lighter browns most closely match the foam of whipped chocolate, while darker browns best match the liquid from the drink or even solid chocolate. 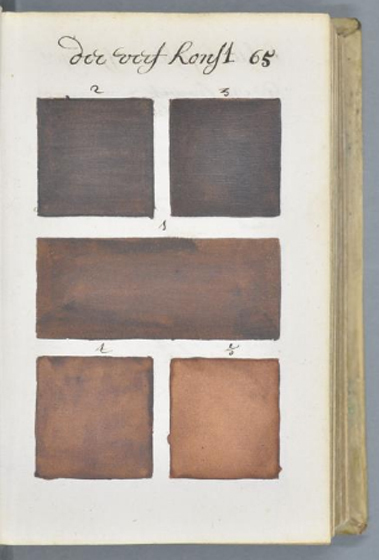 One of the best clues about the hue of chocolate comes from the 1821 edition of Werner’s nomenclature of colours (Figure 2), which includes both a color description and sample. Curiously, “chocolate” describes a red, not a brown (Figure 3). Browns are named for other food terms, such as clove, broccoli, and chestnut. All of this highlights that ideas of color are very much rooted in personal experience. Choices in names evoke a whole slew of associations. Figure 3. 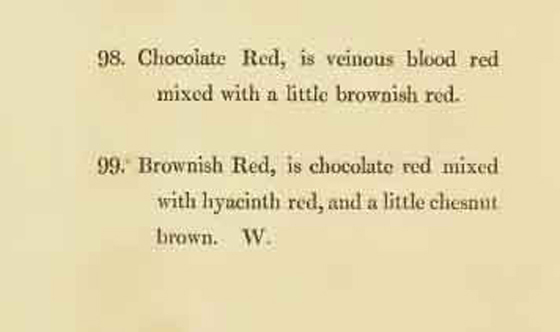 Color description of “Chocolate Red,” p.71 in Werner’s nomenclature of colours. How then, can we pin down “chocolate brown” today? The Munsell color guide provides a kind of Rosetta Stone to translate historic uses of color names and examples into a standard color vocabulary of scales in hue and chroma. The Munsell system avoids references to plants, foods, or animals–quirky, experience-based terms–in favor of more widely applicable descriptions such as “strong” or “very dark.” While we do not find “chocolate” in the Munsell Color Guide, it offers a way to evaluate all the historical nuances of chocolate and personhood; we can see chocolate more clearly. Munsell is a tool of the present to understand color vocabulary of the past.